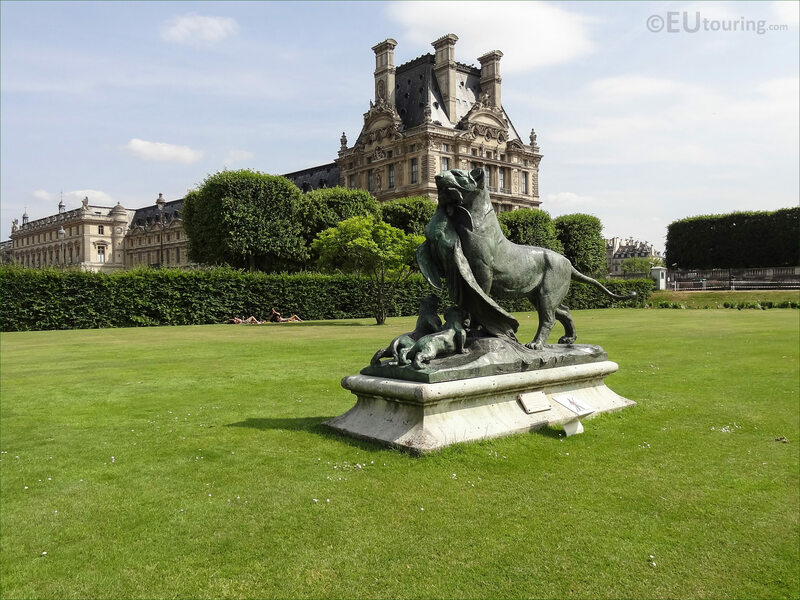 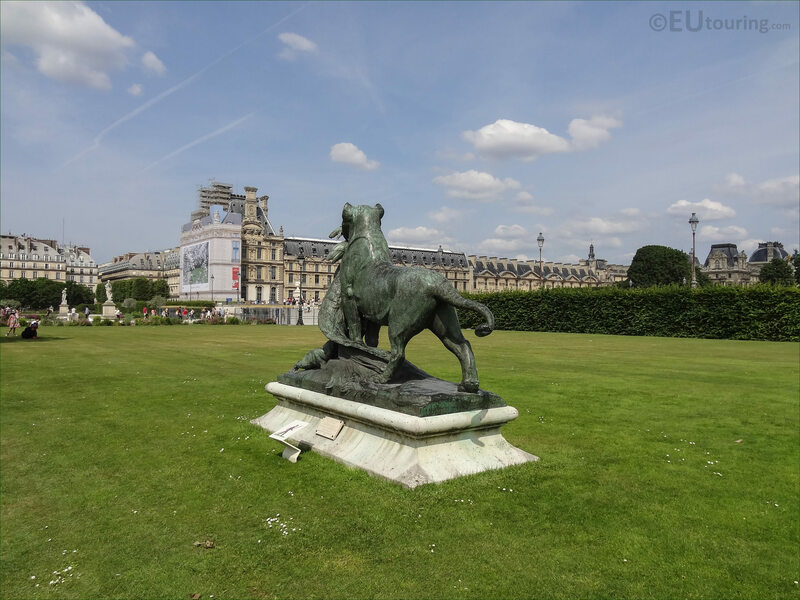 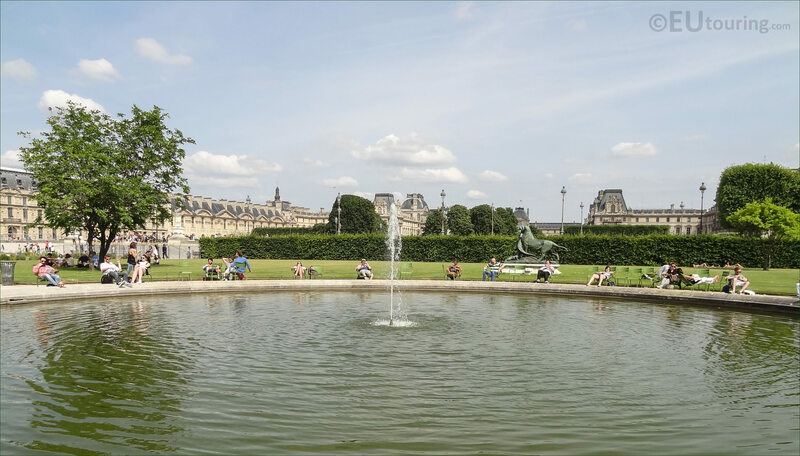 While we were within the Jardin des Tuileries in the first Arrondissement of Paris, we took these high definition photos showing a statue called Tigresse Portant un Paon a ses Petits, which was sculpted by Auguste Cain. 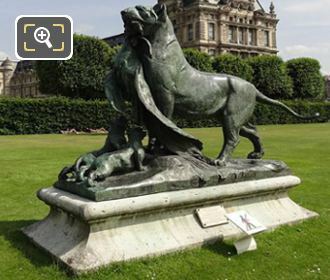 This first HD photo shows a statue that has several different names with the main one being Tigresse Portant un Paon a ses Petits, which translates in English to Tigress Bringing a Peacock to its Young, however, it is also known by the names of Tigress and Peacock or Tigress and Cubs. 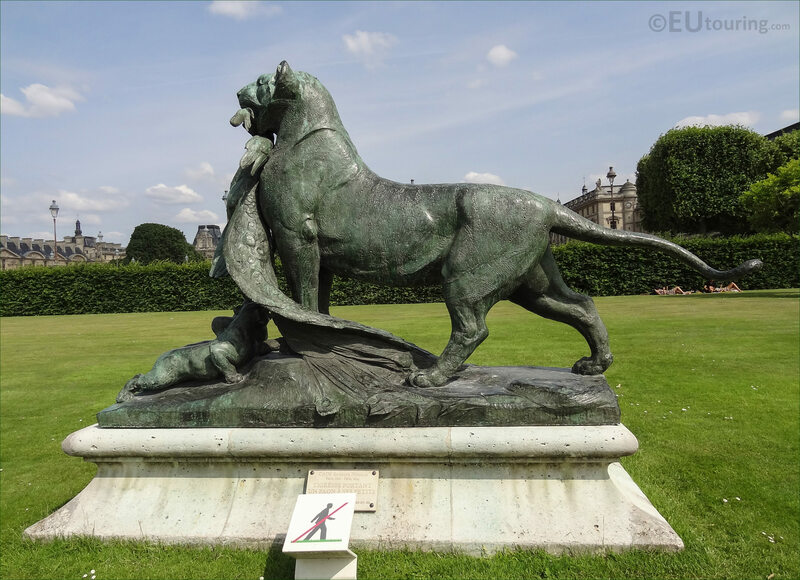 Now this particular monumental statue was sculpted by Auguste Cain between the years of 1873 and 1876 and cast in bronze, it was first shown at the Paris Salon for French Artists before being placed within the Jardin des Tuileries in 1884 within the Grand Carre area of the gardens. 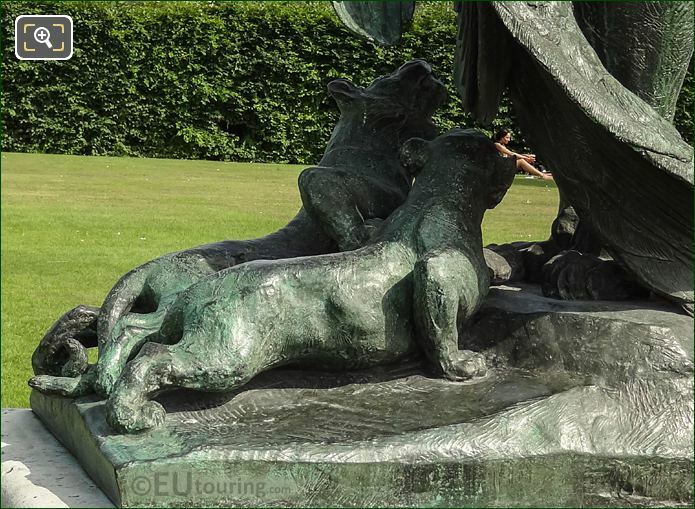 So here you can see a close up photograph showing the two young cubs in front of their mother reaching up towards the peacock that she had brought to her young to feast upon, and this type of realistic scene was a speciality of the sculptor, who produced many statues of animals depicted in a natural setting, often with prey. 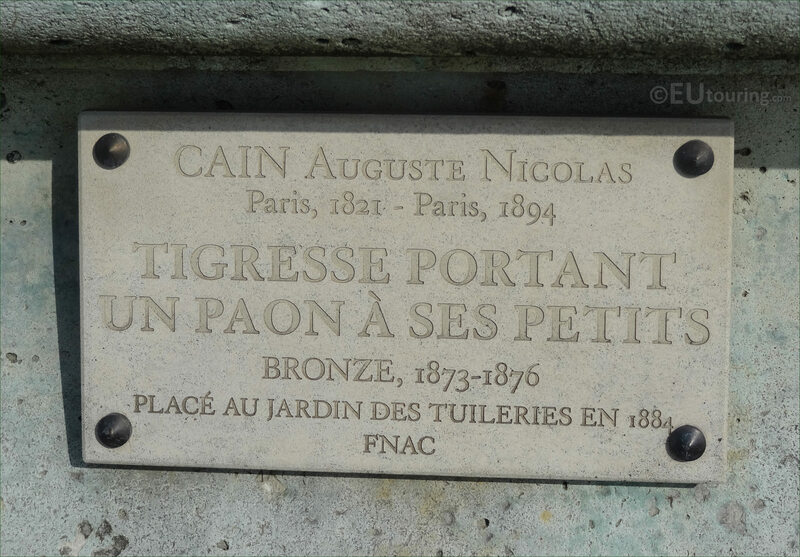 In fact, Auguste Nicolas Cain, who was born in Paris in 1821, studied to become a French sculptor under Francois Rude, yet with his love and fascination of animals he also spent much time within the Jardin des Plantes studying anatomy, then started to produce small decorative objects along with animal figures for famous companies such as Christophle. 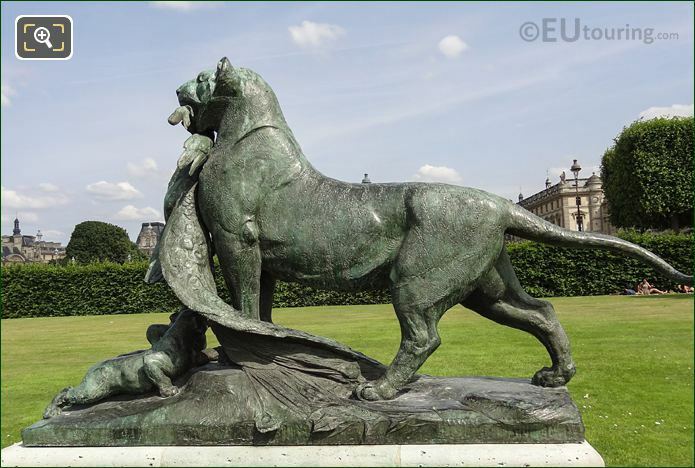 And becoming recognised as an animalier, meaning a sculptor of animals, Auguste Nicolas Cain started to produce larger and monumental statues, many of which were commissioned by the French state to adorn parks of former royal palaces including the Chateau de Chantilly, Palais du Luxembourg and the Jardin des Tuileries. 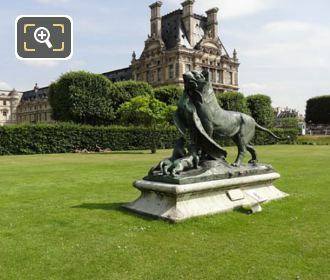 It was the realistic nature of the sculptures and all the fine details that Auguste Cain put into each of his works, which ended up with him having a worldwide reputation, and some were cast in bronze more than once, just like the Tigresse Portant un Paon a ses Petits, where two others can be found in different states of America. Yet the above photograph shows the location of the Tigress and Cubs or Tigress Bringing a Peacock to its Young, positioned by the Vivier Sud, which is the small round basin in the Grand Carre area of the Tuileries Gardens, and placed within the Grand Reserve Sud parterre, you will find another statue on the identical north side of the garden by the other pond, that was also sculpted by Auguste Cain. 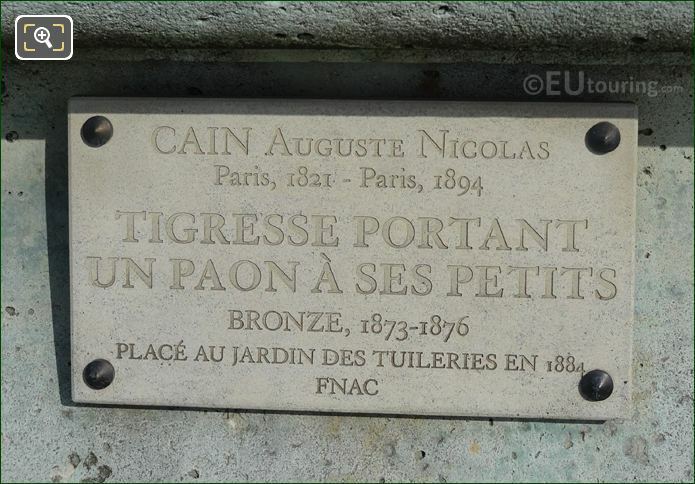 Whereas this close up photograph shows the tourist information plaque positioned on the front of the pedestal below the bronze statue and as you can see it states the name of Tigress Portant un Paon a ses Petits, yet some places spell this as Tigresse Apportant un Paon a ses Petits, and in English these translate to Tigress Bringing a Peacock to its Young. 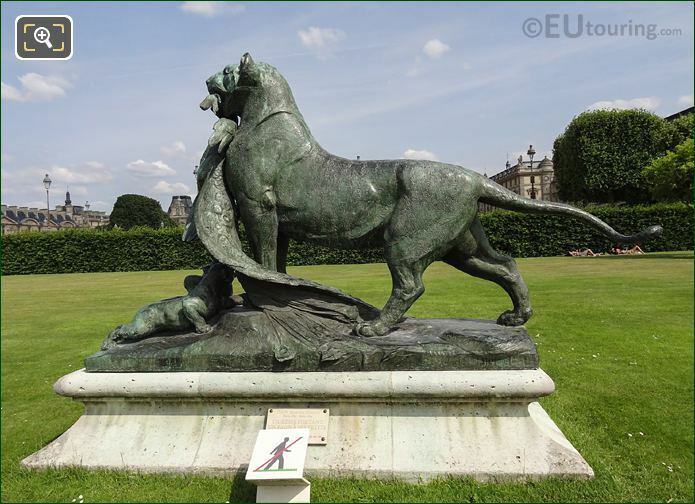 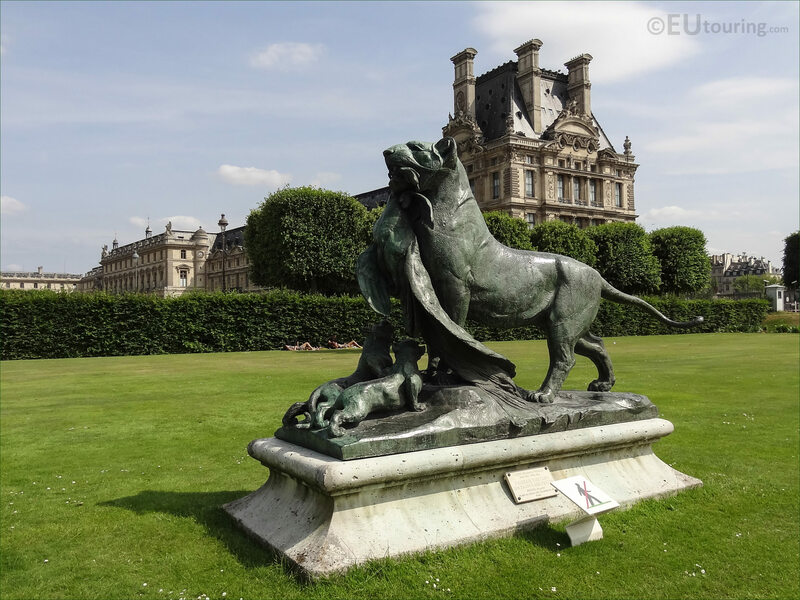 So here is another view of the bronze wild animal statue of a Tigress and Cubs, that was based upon a female Bengal Tiger, and many of the works by Auguste Nicolas Cain depict tigers and lions, although he also sculpted domestic animals, but this particular one was placed in the Tuileries Gardens only 10 years prior to him passing away in 1894, yet four others can also be found within the Jardin des Tuileries.